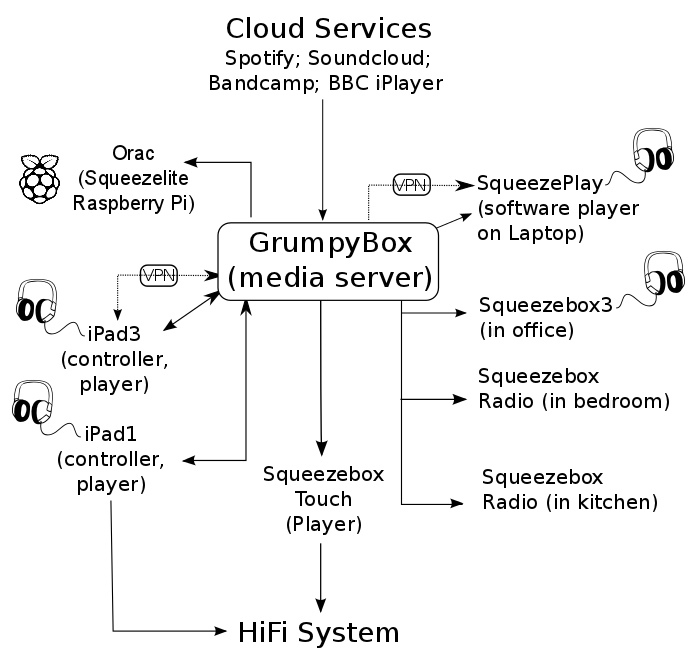 This is a rough illustration of my current implementation of a network of Squeezebox players linked to a NAS (GrumpyBox) running Logitech Media Server (LMS). It consists of several Logitech Squeezeboxes, a couple of iPads that are playback-capable through apps such as SqueezePad and iPeng, and the software Squeezebox emulater, SqueezePlay. To this I have recently added a Raspberry Pi running piCorePlayer. I also have a second Raspberry Pi running Squeezeplug, which has its own instance of LMS (not shown in the diagram). If all you want to do is run a media player connected to an existing LMS, choose the piCorePlayer option. If you need to set up a media server as well as a player, choose the Squeezeplug option. By far the most versatile of the two DAC cards I’ve tried is the Wolfson DAC – if you want to use this, then Squeezeplug or the custom Wolfson kernel options are best. I set up a script for a button press to shutdown the Squeezeplug (and the Wolfson kernel) systems so the Pi can be safely powered down. See here. For both the Raspberry Pi based devices I use, you do need to think about how you interact with them. I use the LMS web interface (usually found at http://IPaddress:9000) with a laptop, or one of the many tablet or smartphone apps that are available (such as the afore-mentioned SqueezePad and iPeng). Installing any of these devices is much easier if you have a reasonable amount of experience with the Linux command line. On the other hand, a Raspberry Pi is a pretty good way to learn the Linux command line!